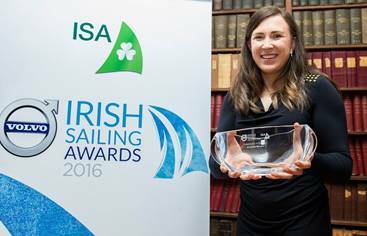 ‘Annalise Murphy – Volvo Irish Sailor of the Year award’. Adding another award to the shelf, Annalise Murphy was named tonight as the Volvo Sailor of the Year at the Volvo Irish Sailing Awards. Hosted by the Irish Sailing Association (ISA), the annual event drew a record crowd of over 300 people from across the sailing community to celebrate an historic year of sailing in 2016, culminating in an Olympic silver medal for Ireland. The Volvo Sailor of the Year Award, newly sponsored by Volvo Car Ireland, drew from a shortlist of nominees from the Afloat Magazine Sailor of the Month winners. The star-studded shortlist included Vendée Globe sailor Enda O’Coineen, Olympic sailors Ryan Seaton and Matt McGovern, and Conor Clarke and the crew of Embarr (winners of the Melges 24 World Championship in Miami). Ewan MacMahon of Howth Yacht Club took home the Volvo Youth Sailor of the year for his silver medal at the KBC Radial Youth Worlds in Dun Laoghaire. The award was hotly contested from a shortlist which shows the depth of talented young sailors flying up the ranks. The nominees included Sophie Crosbie, Girls Topper World Champion; Nicole Hemeryck who finished in the top ten at the Youth Worlds in New Zealand, and Conor O’Beirne who captained Team Ireland at the KBC Radial Youth Worlds. Co. Limerick’s Foynes Yacht Club took home the Volvo ISA Training Centre of the Year award, having been nominated as winners of the South Region. 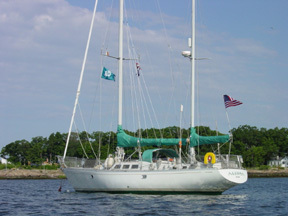 The two other nominees on the shortlist were Mullaghmore Sailing Club (West & North Region winners) and Dublin’s Clontarf Yacht and Boat Club (winner of the East Region). This year, there were two ISA President’s Awards, given to those who have shown exceptional dedication and success in their sailing fields. Rory Fitzpatrick of the ISA received an award for his coaching of Annalise Murphy, and Colin Morehead was honoured for his success with the “Try Sailing” programme in Royal Cork Yacht Club, with over one hundred adults trying sailing for the first time.